Quiche is one of those things that looks really difficult to make but actually isn't. (That is if you don't make your own pie crust and buy some from the grocery store.) This recipe is really tasty, and it involves a couple of my favorite ingredients...bacon and broccoli. Yummy. One word of advice for quiche...It doesn't make a good leftover so try to eat it the same day you make it. Reheated cooked egg is just not ok. End of story. 1. Fit 1 sheet pie crush dough into each of 2 (9”) metal pie pans; flute edges. 2. Prick bottoms with fork; freeze until firm, 20 minutes. 3. Preheat oven to 375 degrees F. In skillet over medium-high heat cook bacon until crisp, 6-8 minutes; drain on paper towels. Discard all but 1 Tbsp. fat from skillet. 4. Over medium-high heat cook onion, salt, pepper and nutmeg until softened, 4-5 minutes; remove from heat. 5. Beat eggs with milk; stir in cheese. Toss broccoli with flour. Place pans on baking sheet. 6. Reserve 2 slices bacon; coarsely chop remaining bacon. 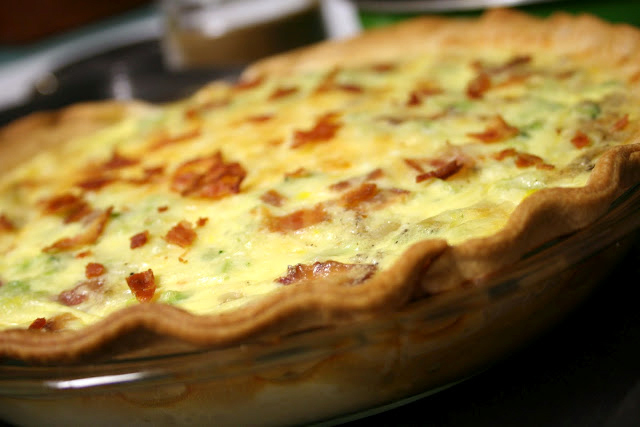 Divide chopped bacon, broccoli and onion mixture between crusts; pour egg mixture into crusts. Bake 40 minutes or until set and golden. Cool 15 minutes. Crumble with remaining bacon. Before serving top quiches with parsley and bacon. 7. To freeze, cool completely. Wrap in plastic wrap and foil. To reheat frozen quiche, thaw in refrigerator. Preheat oven to 350 degrees F. Remove foil and plastic wrap. Bake 25-30 minutes or until heated through. i should make this. I have a pie crust in the freezer that I need to use.